Earlier this year Mem and I went to Thailand and Cambodia, It feels like a lifetime ago now, but one thing that stays fresh in our minds is the food. Although Thailand has a more famous cuisine, Cambodian & Khmer food has so much to offer. Their national curry is certainly one to be proud of. The amok curry, traditionally made with fish, egg and coconut. What I really loved when I tried it was the pop of kaffir lime leaf. I wanted to make at home but as a vegan curry and thought aubergine would be perfect to replace the fish. Cambodian cuisine is more subtle than Thai, we were a little worried after having been in Thailand that we wouldn’t be as satisfied and excited by the flavours, but we were wrong! Although the flavours can be less of an assault on the senses the food is still enchanting, the famous pepper, kampot pepper, shines through in many of the dishes. This curry, while light on the palate was just so moreish and dreamy. The comfort of coconut& tons of fresh kaffir lime leaves made me fall in love with the dish. So I created my aubergine version a few months ago for our Flamingo yoga brunch and have been meaning to share the recipe ever since. Somehow it got a little delayed, as things often seem to in my world, but now here it is! Not 100% authentic amok curry, but I’d say it’s just as delicious. Just make sure you get the fresh kaffir lime leaves. Frozen are also quite good, you can find them in Asian supermarkets probably more easily than fresh. I wouldn’t advise using dried, which I don’t find comparable at all. I served the curry with red rice. A very tasty, whole & healthy rice. 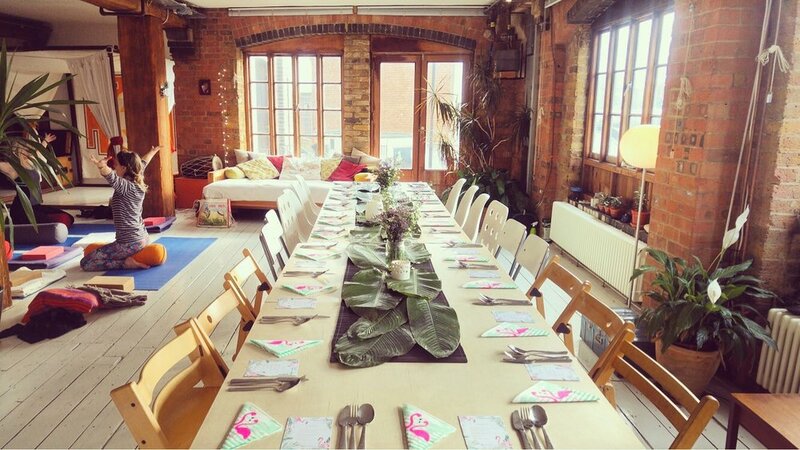 Speaking of flamingos & supper clubs we have another Flamingo Yoga Brunch with Emmy coming up and we still have a few tickets! Inspired by the beautiful fresh food at this time of year, (before we head fully into Autumn). We’ll have seasonal Mexican tostados, Thai basil & chili aubergine & the last of the peaches in a twisted Asian coconut black rice dessert. plus a meal will be donated to someone who needs it for every ticket we sell with Feed Up. If you’re feeling brave, use a pestle and mortar to pound the ingredients until you have a smooth paste, otherwise you can also use a blender. You’ll need a little liquid for the blender so I recommend using the melted coconut oil to help get the process going. A vitamix or equivalent is amazing for this. Heat half of the oil (or what is left from blending the paste), in a large deep pan. Add your onions and cook for a few minutes, add the aubergine, cook with a pinch of salt for about 10 minutes until softened. Remove these from the pan, add the rest of the oil and the paste. Cook for about 7 minutes, stirring to ensure it doesn’t catch and burn on the pan. Add the coconut milk and vegetables back to the pan, cook with the lid on for 25-30 minutes until the aubergine is tender, add your kaffir lime leaves, taste for seasoning. You may not need extra sugar or salt so add a little at a time if it’s necessary. The sugar should balance the curry but not make it sweet. Serve with sliced fresh birds eye chilies, lime wedges, steamed rice and greens.